In the normal course of events a review starts with a table summarising the game. That is to follow. For this game however there is a slight detour as we start out with a picture instead. Darren Hughes had turned the ball over in the 61st minute when the game was all square. He was leading a counter attack down the right wing and receives the ball back from Heaphey who has just come on. Turning inside he sends a kick pass across the defence to Morgan who is in space (just out of frame). Instead of setting up the winning score the ball doesn’t rise off the pitch at all instead skidding away from what can only be described as a square metre of mud. Quite obviously it is an important moment in the game but it also illustrates the conditions the game was played in. The pitch was heavy with quite a few mud patches. There were frequent bursts of quite torrential rain both before and during the game. The ball was greasy, the pitch a quagmire and the day a wet, dark, miserable Irish winter day. This is in complete contrast to both the usual summer weather the averages for games are built upon and even the club games that have been covered on the blog this year. When reviewing the game this context must always be at the forefront. The pitch took the speed out of the game. The weather layered on top of this by forcing shots from closer in than is the norm; between the two teams there was maybe one shot from play that could be considered long range and that came in extra time (see the shot charts in the Appendix). And to top it all off the teams were relatively conservatively set up. Add all three together and you get a grand total of 65 possessions in normal time. Compare that to the 87 in Gaoth Dobhair’s previous game with Crossmaglen or indeed the 97 possessions in the Kilmacud v Portlaoise game. The ball was hard won and it wasn’t easily given up. Gaoth Dobhair had eight more possessions, eight more shots and a tally of just under 4.0 Expt Pts more than Scotstown in the opening 60 minutes. They lost just one of their own 13 kickouts whilst winning 75% (6 of 8) of Scotstown’s kickouts that travelled past the 45. By all known measures they really should have been out of sight … but to Scotstown’s immense credit it was Gaoth Dobhair who had to stage a comeback in the second half when they went three points down after 38 minutes. So how can all these things (Gaoth Dobhair’s apparent dominance and Scotstown’s lead) be true? Shooting accuracy. 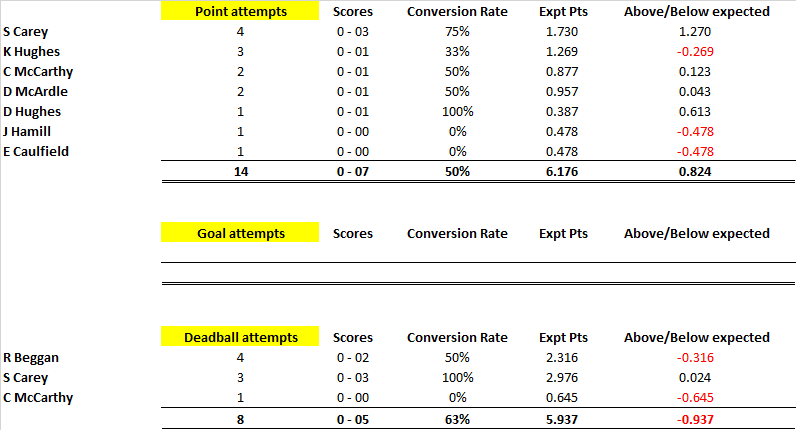 In normal time Gaoth Dobhair returned a relatively poor 48% (0 – 11 from 23; Expt Pts of -1.62) whilst Scotstown, given the conditions, produced a quite remarkable 73% (0 – 11 from 15; Expt Pts of +2.19). There was a trend apparent in normal time which was to prove crucial during extra time. As can be seen from the shot charts Scotstown’s shooting during normal time was from much further out than Gaoth Dobhair’s. “Much” might be a stretch but in the conditions every metre mattered. 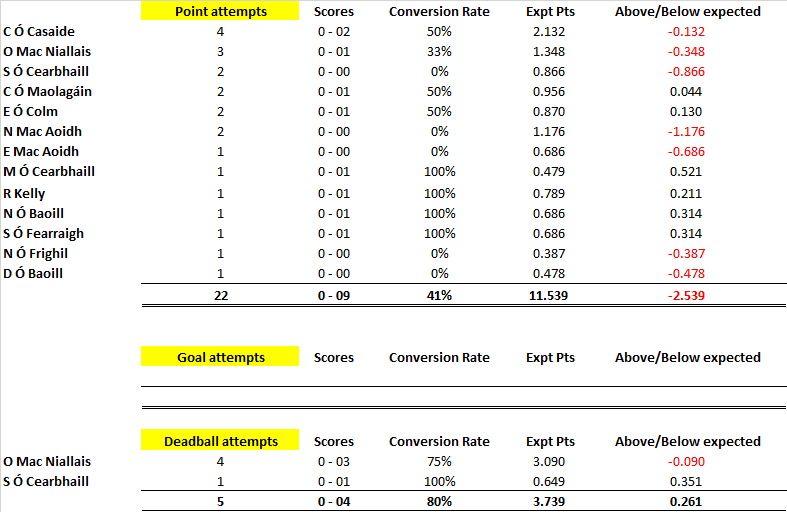 Of Scotstown’s point attempts from play 80% (8 of 10) came from “outside” (as denoted by the dotted red line) whereas only 47% (9 of 19) of Gaoth Dobhair’s shooting was from “outside”. When we get to extra time we see that Gath Dobhair scored 0 – 02 from their four attempts with the two points coming from right in front of goal whereas Scotstown missed their four attempts with none coming from close range. Gaoth Dobhair were able to get inside, as they had done all game, during extra time when everyone was exhausted, both mentally and physically, from the day, the pitch, the enormity of the occasion, whereas Scotstown were never able to break down the Gaoth Dobhair defence. Details of both teams’ shooting and assists can be found below but once again it is worth highlighting Odhran Mac Niallais. He has produced excellent numbers for a putative midfielder. He topped the assists chart the last day with five primary assists against Crossmaglen and does so again here, in conjunction with M Ó Cearbhaill, on four. He also tops the shooting tables across the two games with eight point attempts combined (50% conversion; Expt Pts of +0.427). And just to top it off he is Gaoth Dobhair’s main free taker (taken 14 of 19 attempted across the three games covered). Given the nature of the game what the teams did after winning the kickout is of less importance here than just winning the kickout. 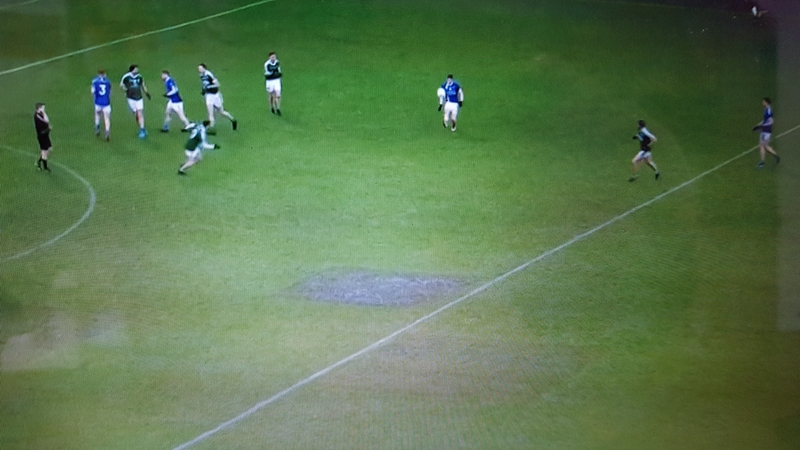 And Gaoth Dobhair controlled this section of the game winning 67% (12 of 18) of all kickouts that went past the 45 including 11 of 14 in normal time.